The future of the rare Sumatran elephant is at risk from habitat loss and it could be wiped out within 30 years, says top conservation group WWF. The Sumatran elephant population has already been halved in a generation and almost 70% of its habitat has been lost due to deforestation and plantations, the environmental group says. As a result, the status of the Sumatran elephant has risen from "endangered" to "critically endangered" on the IUCN Red List of Threatened Species and the WWF has urged the Indonesian Government to immediately halt habitat loss. The Red List states, "Although as a species Sumatran elephants are protected under Indonesia law, eighty five per cent of their habitats which are located outside of protected areas, are outside of the protection system and likely to be converted to agricultural and other purposes." There are thought to be up to 2,800 Sumatran elephants (Elephas maximus sumatranus) in the wild, which is half the figure estimated in 1985. Scientists fear that if the habitat loss continues, the species could disappear from the wild in under 30 years. Dr. Carlos Drews, Director of WWF's Global Species Programme, says, "The Sumatran elephant joins a growing list of Indonesian species that are critically endangered, including the Sumatran orangutan, the Javan and Sumatran rhinos and the Sumatran tiger. The Red List is produced by the International Union for Conservation of Nature and Natural Resources. Apart from Sri Lanka and India, it is believed that Sumatra is home to some of the largest numbers of Asian elephants, but it also lost more than two-thirds of its lowland forest - the best elephant habitat - within 25 years. WWF is urging the Government of Indonesia to stop deforestation in the elephants' natural home, until a conservation plan is introduced. It also wants the government to identify and protect significant habitat areas and connect smaller habitats by conservation corridors. Asian elephant expert Ajay Desai says, "It's very important that the Government of Indonesia, conservation organizations and agro-forestry companies recognize the critical status of elephant and other wildlife in Sumatra and take effective steps to conserve them. "Indonesia must act now before it's too late to protect Sumatra's last remaining natural forests, especially elephant habitats." In Riau Province, elephant numbers have fallen 80 per cent under 25 years due to deforestation by paper and pulp industries and oil palm plantations. Anwar Purwoto, from WWF-Indonesia, says, "Riau Province has already lost six of its nine herds to extinction. The last surviving elephants may soon disappear if the government doesn't take steps to stop forest conversion and effectively protect the elephants. "Forest concession holders such as pulp and paper companies and the palm oil industry have a legal and ethical obligation to protect endangered species within their concessions." In Lampung Province forest loss has caused the number of elephant herds has dropped from 12 in the 1980 to just three by 2002 and only two are thought to be biologically viable. Dr. A. Christy Williams, Head of WWF's Asian Elephant Programme, says, "In the mid-1980s, Sumatra had forty-four elephant populations spread across all of its eight provinces, and the island still had half of its natural forests. "Due to conversions of those forests for human settlement and agricultural production, many elephant populations have come into serious conflicts with humans. 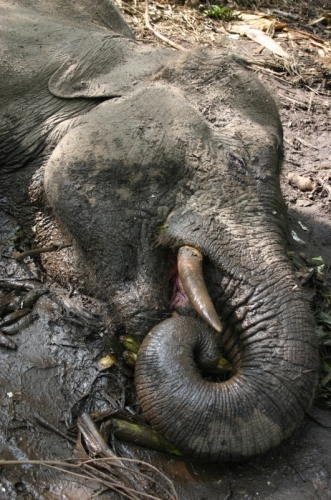 As a result, a large number of elephants have been captured from the wild or killed." WWF calls on all parties, including the Indonesian Government, oil palm companies, the pulp and paper industry and environmental groups, to work together to conserve the Sumatran elephants' habitat. WWF has more than five million supporters and a global network active in more than 100 countries. WWF works to stop the degradation of the earth's natural environment and help humans live in harmony with nature, through conservation, the use of sustainable and renewable natural resources and reducing pollution.